Having completed years of research in the “unknown, untold and unconventional”, Master Soon, shares with you how the year of the green wood horse 2014 will influence Malaysia. 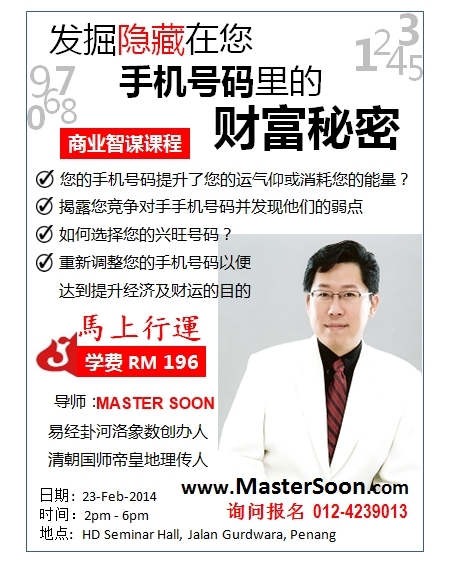 Master Soon has completed 20 years of research in the unknown Chinese metaphysics, untold Chinese mind strategies, unorthodox luck changing methodology; and has years to his name, specialising in business feng shui consultation apart from being a consultant in enlightening and inspiring using Chinese metaphysics. He has also been invited by corporations in Malaysia, Singapore, Switzerland, India, Thailand, Hong Kong and China to share his knowledge. Some of his past seminars include topics on “Feng shui for property investors”, “How to select an auspicious property”, “Activating home feng shui”, “property investment and property projection”, “economy and development perspective” and others. His proven unconventional methodology in luck design is said to be effective, striking and impressive.